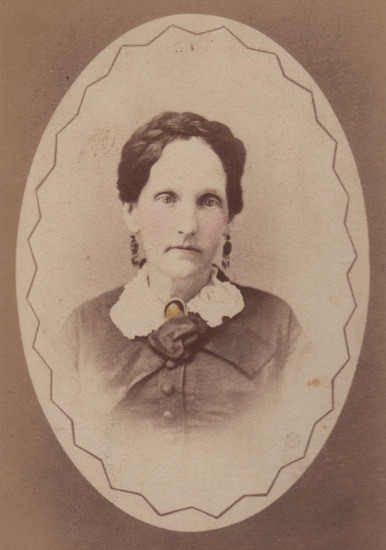 Comments: Elizabeth (Tompkins) Moon was born on 03 March 1826 and was the daughter of Dr. Samuel Waddy Tompkins and Sarah Elizabeth (Gilmer) Tompkins. On April 21, 1847, Elizabeth married John Schuyler Moon (1823-1876) in Albemarle County, Virginia. John was the son of John Digges Moon and Mary Elizabeth (Barclay) Moon, and he was a successful lawyer. After their marriage, John and Elizabeth soon moved to John's farm at Stony Point; see photo at right. This house at Stony Point no longer exists but was located on the road at right of the current Scottsville water tower on Hardware Street north of town. Later John and Elizabeth purchased Church Hill farm where they spent their summers. In 1870, John Schuyler Moon sold Stony Point to Jacob Luther Moon and purchased Snowden in Buckingham County, Virginia, from Captain John Harris. 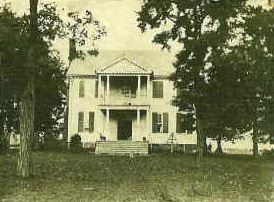 Located just across the James River from Scottsville, Snowden was built in the Colonial style, and the walls of Snowden's rooms were covered in wall paper imported from England. This quaint paper in bold design was still preserved in one of the Snowden rooms in 1938. John Schuyler Moon was a Baptist, and he died at Snowden on December 19, 1876. Elizabeth Tompkins Moon, his wife, passed away in October 1891, and she is buried near her husband at Mt. Ayr cemetery in Albemarle County, VA. John Schuyler Moon and Elizabeth Tompkins Moon were the parents of the following children: Waddy Moon, John Russell Moon, Gilmer Moon, Edward Moon, Lilla Moon, Elizabeth Moon, Charles Moon, Clarence B. Moon, Frank Carlton Moon, Ellen Gilmer Moon, Sarah Margaret Moon, Mary Belle Moon, Schuyler Barclay Moon, and Lizzie Laurelle Moon. This photo of Elizabeth Tompkins Moon was provided courtesy of Cenie Re Sturm, Scottsville, VA. The photo was the product of The Lee Gallery in Richmond, VA.
1. Sketches of The Moon and Barclay Families Including the Harris, Moorman, Johnson, Appling Families compiled by Anna Mary Moon, Chattanooga, Tennessee, November, 1938; p. 11. 3. Mt. Ayr Cemetery, Keene, https://scottsvillemuseum.com/cemeteries/MtAyre/home.html .